First of all, do not be intimidated! Many women are put off from picking up a dumbbell by the fear of getting ‘bulky’. This is not going to happen. Weight training will not turn a woman into Iris Kyle (Ms. Olympia 2006-2012). Similarly, men should not feel they need to be squatting 160kg. On the other hand, if you are interested in starting bodybuilding, DO NOT walk into the gym and pick up a 20kg dumbbell. That is only going to end in disaster. We see too many people give up their exercise regimen because of pain or injury. It is important that you use correct technique when performing any exercise. As you begin to lift heavier weights, it is essential that you have adequate core stability in order to prevent injuring your back. Once you understand correct technique, continue to monitor your form to prevent injury as you fatigue during a workout. 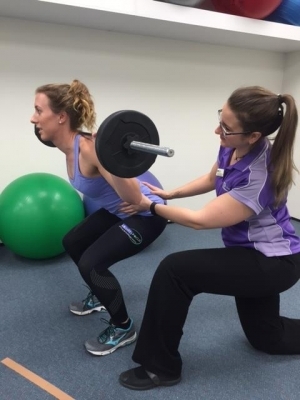 If you are new to weight training, or are unsure regarding your technique, consult a physiotherapist for an in-depth assessment of your core strength and movement techniques. So how much should you be doing? Research indicates that between 20 to 60 minutes of weight training 2-3 times per week is sufficient to obtain health benefits. Choose a weight that is comfortable for the level you are at. The biggest thing is to not over do it. Muscles rebuild and repair during times of rest. It is recommended that you give any given muscle group 48 hours rest between training sessions. You may be sore during this period, but soreness is not essential for muscle development, contrary to popular belief. Do not mistake injury pain for post-exercise soreness. If it lingers for more than 48 hours, consult your healthcare professional. If you are experiencing any pain or discomfort with exercises, seek the advice of a qualified healthcare professional. Finally, signing up for an 8-week program, which many local gyms are currently offering, is a great way to get the ball rolling. You will learn valuable lessons in nutrition and have an exercise program tailored to suit your goals. However, when the 8 weeks are over, you need to make sure you don’t fall back into old habits. Guarantee yourself success by setting the long-term goal of making a lifestyle change, as well as short-term fitness goals. Well, what are you waiting for? Why not start today?